If you like to travel a lot then you probably have lots of video footage that you recorded at the various locations that you’ve visited. So why not make use of that footage and create a professional-looking travel movie of your very own that you can share with your friends and family, or even publish online. Most people shy away from the idea because of how complicated they assume it will be, but the truth is it doesn’t have to be. 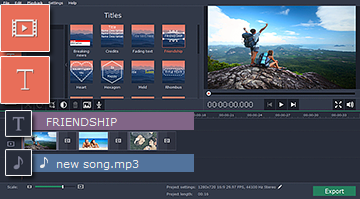 It is actually quite easy to make a professional-looking travel movie and all that you really need is Movavi Video Editor. The first thing that you need to do is load the footage that you’ve recorded into Movavi Video Editor and cut it into the movie that you want it to be. Start by trimming out all the footage that you don’t need – so that only the best parts remain. Then, decide which footage you want to use and in what sequence you want everything to appear. Because you’re using Movavi Video Editor, all of this can be done without breaking a sweat. To cut the footage you can simply position a marker and click the ‘Scissors’ icon to split it at that point, and then delete the segments you don’t need. Similarly, combining the segments that you do want into a particular sequence simply involves dragging and dropping them into place. Once you have the ‘final cut’ of your travel movie (so to speak) you can then polish and jazz it up a little. For that you can rely on the other features of Movavi Video Editor to improve the quality of your videos, insert animated transitions between segments of video, and apply special effects and filters. In fact you may also want to add an audio track to your travel movie to include some background music, or possibly even a voiceover to narrate it in some way. As you can see it really is quite easy to make your own movie using Movavi Video Editor. All the features that you need are right there and the only thing you need to do is familiarize yourself with them and then apply them as you see fit. The end result will be a professional-looking travel movie that you can be proud of.